This article is about the town. For the Malayalam film, see Aparan (film). Aparan (Armenian: Ապարան), is a town and urban municipal community in Armenia, located in the Aragatsotn Province, about 50 kilometers northwest of the capital Yerevan. As of the 2011 census, the population of the town was 6,451. As per the 2016 official estimate, Aparan has a population of around 5,300. It is commonly believed that the name of Aparan is derived from the Armenian word of Aparank; meaning a royal palace. However, throughout the history, the town was known with different names including Kasagh, Paraznavert, Abaran and Abaran Verin. Later, it was known as Bash Aparan (Բաշ Ապարան) until 1935, when the name was finally changed to Aparan. The first reference to the town of Aparan was made by Ptolemy during the 2nd century. 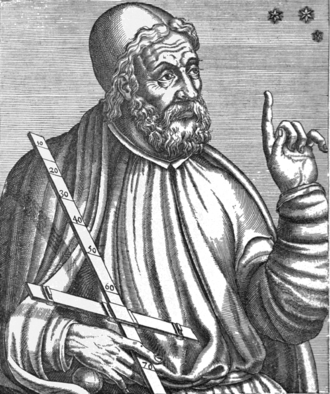 Ptolemy referred to the settlement as Casala; the Hellenized version of the Armenian name of Kasagh. It was the centre of Nig canton of the Ayrarat province of ancient Armenia. Kasagh was under the administration of the Gntunik Armenian noble family, under the rule of the Arsacid dynasty of Armenia. 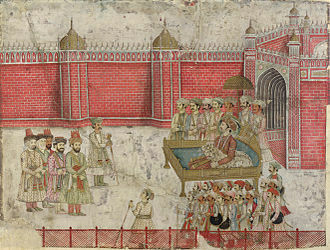 The Gntunik princes founded the Basilica of Kasagh by the end of the 4th and beginning of the 5th centuries. Between the 9th and 1th[clarification needed] centuries, Aparan was part of the Bagratid Kingdom of Armenia. Starting from the 10th century, the settlement of Kasagh became known as Aparan. The new name was originated from the village of Aparank located in the Moxoene province of the Kingdom of Armenia, when some remains from the ancient Armenian monastery of Surp Khach of Aparan were transferred to the town of Kasagh. After the fall of Ani to the Byzantines in 1045, the Seljuks occupied most parts of the Armenian Highland by 1064. In the mid 13th century, Armenia became part of the Ilkhanate of the Mongol Empire. 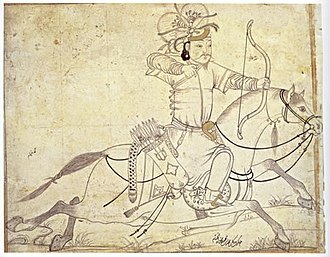 By the last quarter of the 14th century, the Aq Qoyunlu Sunni Oghuz Turkic tribe took over Armenia, including Aparan, before being invaded by Timur in 1400. In 1410, Armenia fell under the control of the Kara Koyunlu Shia Oghuz Turkic tribe. 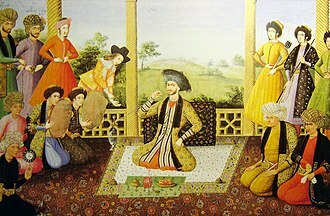 Between 1502 and 1828, Armenia became part of the Persian state under the rule of Safaavid, Afsharid and Qajar dynasties, with short periods of Ottoman rule between 1578 and 1603 and later between 1722 and 1736. Aparan was part of the Erivan Khanate of Persia. In the 16th century, the Latin diocese of Nakhchivan's actual see (not the title) was moved to more central Aparan, closer to the actual Catholic communities. Around 1620, Pope Gregory XV instigated the founding of a Fratres Unitores (exclusive Armenian Dominican order branch) seminary in Aparan. The see was elevated on 21 February 1633 as non-Metropolitan Archdiocese of Nakhchivan, but diocesan activity seemingly effectively halted later that century. 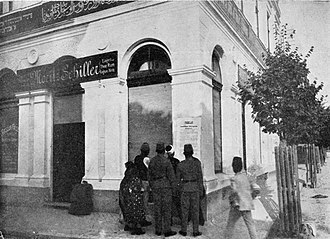 It would be suppressed in 1847, apparently vacant since 1765, as its faithful had fled the country during the devastating wars between the Ottomans and Safavids. The Armenian historian Zacharia of Kanaker, used the name Kasagh to refer to Aparan during the 17th century. 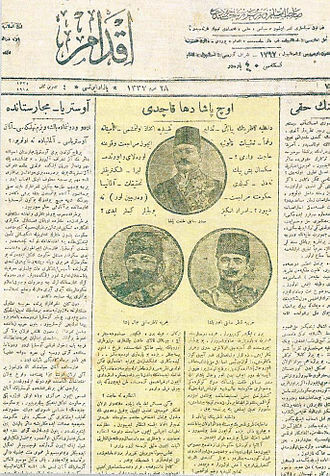 Starting from the 18th century, Aparan became known as Bash Aparan in Persian and Turkic documents. In 1828, after the Russo-Persian War, Aparan was among the lands that were handed over to the Russian Empire as a result of the Treaty of Turkmenchay signed on 21 February 1828. During the years of the Armenian Genocide, many Armenian refuge families arrived in Bash-Aparan from the Western Armenian cities of Van, Mush, Alashkert and Karin between 1914-1918. Many other families had also arrived from the Eastern Armenian town of Khoy. The town was the site of the famous Battle of Abaran against the Turkish army on May 21, 1918 during the Caucasus Campaign of World War I, when the Turkish invasion of the newly-independent Republic of Armenia was turned around. During the brief period of independence, Bash-Aparan became a gavar (administrative district) of Armenia. Under the Soviet rule, the Bash-Aparan raion was founded in 1930. In 1935, the name was officially changed to Aparan. In 1963, Aparan was granted with the status of an urban-type settlement. An impressive monument to the Battle of Abaran was erected in 1978 just north of the town, designed by architect Rafael Israelyan. Following the independence of Armenia from the Soviet Union, Aparan was given the status of a town within the Aragatsotn Province, as per the administrative reforms of 1995. Historically, Aparan is located in Nig canton of Ayrarat Province of the Kingdom of Armenia Mayor. Modern-day Aparan is located at the eastern slopes of Mount Aragats and the northern slopes of Mount Ara, on the shores of Kasagh River, with an elevation of 1880 metres above sea level. The town is located at a road distance of 42 km north of Yerevan and 32 km north of the provincial capital Ashtarak, on the main north-south road of Armenia. Aparan has an Alpine climate in general with the influence of cold semi-arid climate. the town is characterized with snowy winters and mild humid summers. The average temperature is around -7 °C in winter and 18 °C in summer. The annual precipitation amount is between 450-600 millimeters. Many residents of Aparan are the descendents of Armenian migrants from the cities of Van, Mush, Alashkert and Karin, who arrived in the area escaping the massacres of the Armenians during World War I. Currently the town has a predominantly Armenian population with a very small (~1%) minority of Pontic Greeks and Kurds. The vast majority of the population belong to the Armenian Apostolic Church. The regulating body of the church is the Diocese of Aragatsotn with the Saint Mesrop Mashtots Cathedral in Oshakan. 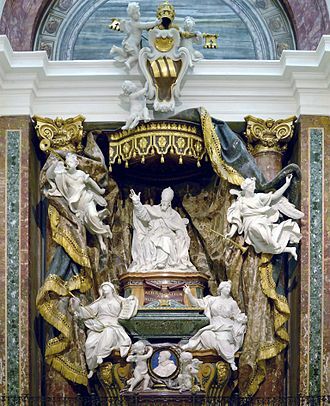 The churches of the Holy Cross and the Holy Mother of God, dating back to the 5th and 19th centuries respectively, are still operating up to the day. Aparan has a palace of culture, a public library, a music school, and a school of art run by the municipality. Kasagh Basilica of the Holy Cross, built during the 4th century, one of the oldest surviving churches in the Armenian highland. The church is undated and was partly restored in 1877. Monument to the Battle of Abaran erected in 1978. Mausoleum of General Drastamat Kanayan near the battle memorial, reburied in Aparan on 28 May 2000. Aparan Alphabet park and the statue of the 12th-century Armenian scholar Mkhitar Gosh. The 33-meters high Holy Cross of Aparan and the Holy Trinity Altar of Hope consecrated in October 2012. The cross is a metallic structure consisted of a number of small metallic crosses, referring to the number of years since Armenia adopted Christianity in 301. Thus, every year in October, a cross is being added to the monumental structure. Aparan is located on the M-3 Motorway that connects the Armenian capital Yerevan with the Georgian capital Tbilisi, passing through Aparan on the way to Lori Province. A network of regional roads connects the town with the surrounding villages, as well as the provinces of Shirak and Armavir. 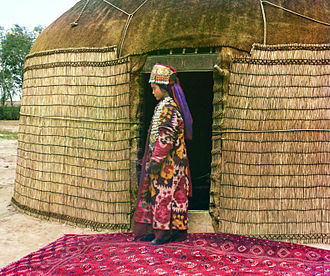 Aparan used to be a major centre of carpet and textile production during the Soviet years. However, with collapse of the USSR the economy had drastically declined. Currently, Aparan is home to the Nig factory for electrical products founded in 1964, the Aparan Cheese Factory founded in 1982 (privatized in 1995), and the Aparan Group for bottled water, soft drinks and dairy products, founded in 2006, and the Gntunik plant for bakery and dairy products. Many restaurants of Aparan offer local and traditional cuisine within the picturesque nature around the town. The tourist are served with the Kasaghi Amrots boutique hotel. As of 2017, Aparan is home to 2 primary schools, as well as the Aparan physics and mathematics high school. There are also 2 pre-school kindergartens operating in the town. The Aparan physics and mathematics high school was founded in 2009 on the basis of Yeghishe Varzhapet's school opened in 1903. Currently, housing around 180 students, the school has specialized classes in humanities, natural science and mathematics. The school is equipped with up-to-date laboratories for physics, chemistry, and biology, along with 2 computer rooms. FC Nig Aparan represented the town in the domestic football competitions after the independence of Armenia. However, like many other Armenian clubs, it was dissolved in 1999 due to financial difficulties. The town has a sports school with a football training field. Aparan used to be a major centre for winter sports. A ski resort with ski lifts used to operate near the town during the Soviet days. It is envisaged to rebuild the resort in the near future. Wikimedia Commons has media related to Aparan. ^ a b Thierry, Jean-Michel (1989). 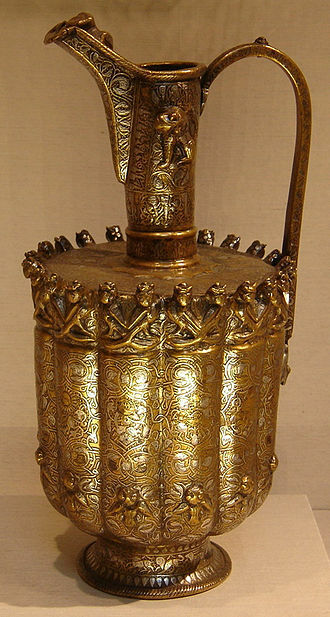 Armenian Art. New York: Harry N. Abrams. p. 545. ISBN 0-8109-0625-2. 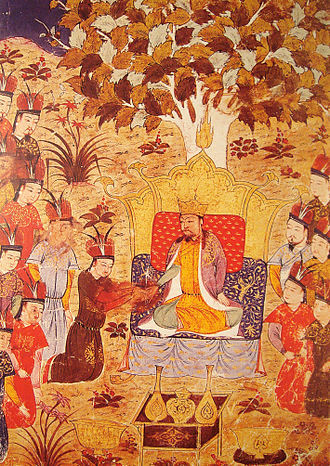 The Kara Koyunlu Turkomans at one point established their capital in Herat in eastern Iran. They were vassals of the Jalairid Sultanate in Baghdad and Tabriz from about 1375, they rebelled against the Jalairids, and secured their independence from the dynasty with the conquest of Tabriz by Qara Yusuf. 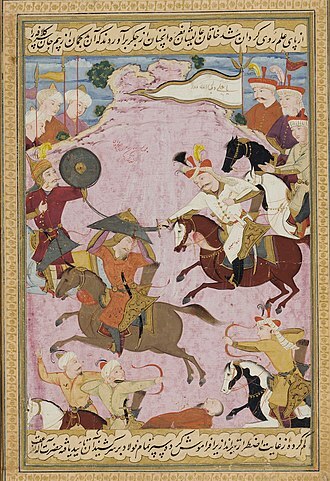 In 1400, Timur defeated the Kara Koyunlu, and Qara Yusuf fled to Egypt and he gathered an army and by 1406 had taken back Tabriz. In 1410, the Kara Koyunlu captured Baghdad, the installation of a subsidiary Black Sheep line there hastened the downfall of the Jalairids they had once served. 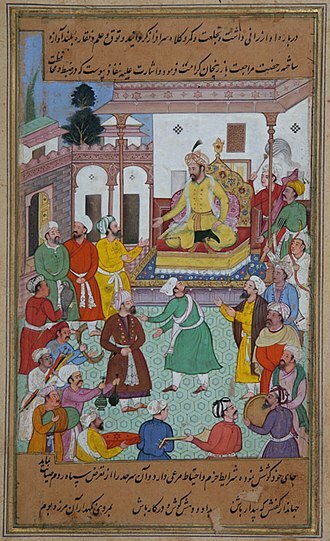 Jahan Shah made peace with the Timurid Shahrukh Mirza, when Shahrukh Mirza died in 1447, the Black Sheep Turkomans annexed portions of Iraq and the eastern coast of the Arabian Peninsula as well as Timurid-controlled western Iran. 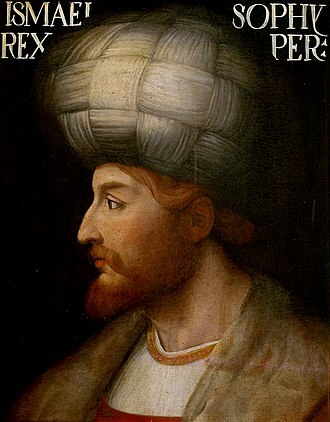 Though much territory was gained during his rule, Jahān Shāhs reign was troubled by his rebellious sons and the almost autonomous rulers of Baghdad, by 1468, at their height under Uzun Hassan, Aq Qoyunlu defeated the Qara Qoyunlu and conquered Iraq and western Iran. Armenia fell under the control of the Kara Koyunlu in 1410, the principal Armenian sources available in this period come from the historian Tovma Metsopetsi and several colophons to contemporary manuscripts. According to Tovma, although the Kara Koyunlu levied heavy taxes against the Armenians and this peaceful period was, shattered with the rise of Qara Iskander, who reportedly made Armenia a desert and subjected it to devastation and plunder, to slaughter, and captivity. 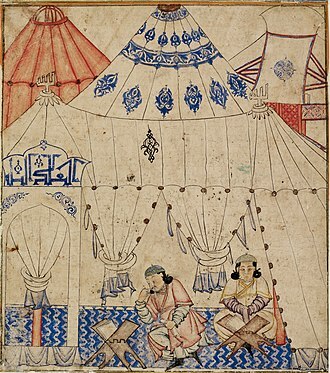 Iskander did attempt to reconcile with the Armenians by appointing an Armenian from a family, Rustum. When the Timurids launched their final incursion into the region, they convinced Jihanshah, Iskanders brother, Jihanshah pursued a policy of persecution against the Armenians in Syunik and colophons to Armenian manuscripts record the sacking of the Tatev monastery by his forces. 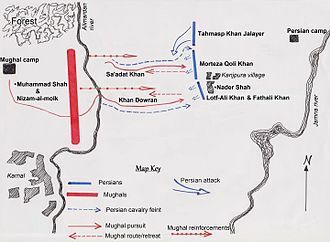 For all this, Jihanshah continued to attack Armenian towns and take Armenian captives as the country saw further devastation in the years of Jihanshahs failed struggles with the Aq Qoyunlu. The Kingdom of Armenia, the Kingdom of Greater Armenia, or simply Greater Armenia, was a monarchy in the Ancient Near East which existed from 321 BC to 428 AD. 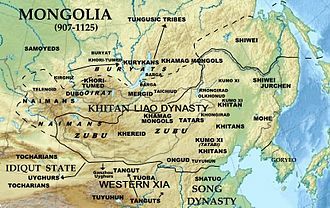 Its history is divided into successive reigns by three dynasties, Orontid and Arsacid. It is widely believed to be the region with which all Armenians descend from and it was one of the largest empires in the history of the Middle East. Under the Seleucid Empire, the Armenian throne was divided in two – Armenia Maior and Sophene – both of which passed to members of the Artaxiad dynasty in 189 BC. 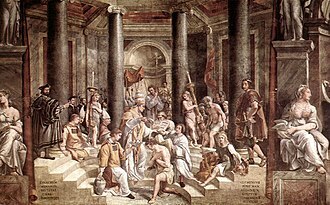 The remaining Artaxiad kings ruled as clients of Rome until they were overthrown in 12 AD due to their allegiance to Romes main rival in the region. During the Roman–Parthian Wars, the Arsacid dynasty of Armenia was founded when Tiridates I, throughout most of its history during this period, Armenia was heavily contested between Rome and Parthia, and the Armenian nobility was divided among pro-Roman, pro-Parthian or neutrals. From 114 to 118, Armenia briefly became a province of the Roman Empire under Emperor Trajan, the Kingdom of Armenia often served as a client state or vassal at the frontier of the two large empires and their successors, the Byzantine and Sassanid empires. In 301, Tiridates III proclaimed Christianity as the religion of Armenia. 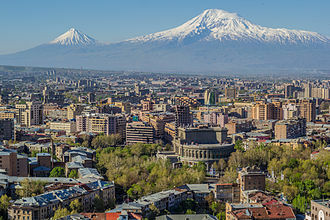 During the Byzantine–Sasanian wars, Armenia was ultimately partitioned into Byzantine Armenia in 387, the Kingdoms symbol and most famous icon was Mount Ararat, arguably the tallest mountain in the kingdom. The geographic Armenian Highlands, known as the highlands of Ararat, was inhabited by Proto-Armenian tribes which did not yet constitute a unitary state or nation. The highlands were first united by tribes in the vicinity of Lake Van into the Kingdom of Van, the kingdom competed with Assyria over supremacy in the highlands of Ararat and the Fertile Crescent. Both kingdoms fell to Iranian invaders from the neighbouring East in the 6th century BC and its territory was reorganized into a satrapy called Armenia. The Orontid dynasty ruled as satraps of the Achaemenid Empire for three centuries until the defeat against Alexander the Greats Macedonian Empire at the Battle of Gaugamela in 331 BC. 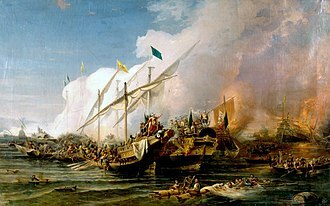 After Alexanders death in 323 BC, a Macedonian general named Neoptolemus obtained Armenia until he died in 321 BC and the Orontids returned, not as satraps, Orontes III defeated the Thessalian commander Menon, who wanted to capture Spers gold mines. Van is a city in eastern Turkeys Van Province, located on the eastern shore of Lake Van. The city has a history as a major urban area. It has been a city since the first millennium BC, initially as the capital of Urartu in the 9th century BC. It remained an important center of Armenian culture until the Armenian Genocide of 1915, Van has a Kurdish majority and a sizeable Turkish minority. The Van Central district stretches over 2,289 square kilometres, archaeological excavations and surveys carried out in Van province indicate that the history of human settlement in this region goes back at least as far as 5000 BC. The Tilkitepe Mound, which is on the shores of Lake Van, under the ancient name of Tushpa, Van was the capital of the Urartian kingdom in the 9th century BC. The early settlement was centered on the bluff now known as Van Castle, close to the edge of Lake Van. Here have been found Urartian cuneiform inscriptions dating to the 8th and 7th centuries BC, in the trilingual Behistun inscription, carved in the order of Darius the Great of Persia, the country referred to as Urartu in Babylonian is called Armenia in Old Persian. The name Van comes from the Urartian Biaina, the region came under the control of the Orontids in the 7th century BC and quickly the Persians in the mid 6th century BC. The inscription survives in perfect condition and is divided into three columns of 27 lines written in Old Persian and Elamite. In 331 BC, Van was conquered by Alexander the Great, by the early 2nd century BC it was part of the Kingdom of Armenia. It became an important center during the reign of the Armenian king, Tigranes II, in the early centuries BC, it fell to the emerging Arsacid dynasty of Parthia until the 3rd century AD. However, it fell once to the Arsacid Dynasty of Armenia in this timespan. 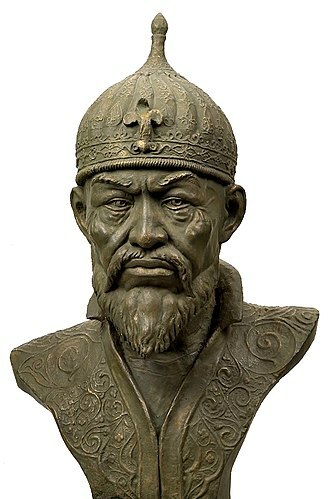 In the History of Armenia attributed to Movses Khorenatsi, the city is called Tosp, following the fall of the Parthians and the emergence of the Neo-Persian Empire, better known as the Sassanian Empire, the town naturally fell into the possession of the latter. During the over 700 years lasting Roman-Persian Wars, some of the wars razed at or around the location of modern-day Van, decline in Arab power eventually allowed local Armenian rulers to re-emerge, with the Artsruni dynasty soon becoming the most powerful. Drastamat Kanayan, better known as Dro, was an Armenian military commander and politician, a member of the Armenian Revolutionary Federation. He served as Defense Minister of Armenia in 1920, during the brief independence. During World War II, he led the Armenian Legion, Drastamat Kanayan was born in Surmali, Russian Empire in 1884. He was the son of Martiros Kanayan, the head of the Kanayan clan in Igdir, at an early age, Martiros enrolled his son to the parish school of Igdir. Drastamat would skip school to hang out near the barracks of Igdir because of his interest in the military exercises held there. Igdir at the time was an important military post where between 8000 and 10000 Russian troops were stationed including infantry, Cossacks and border guards, most of the inhabitants of the village thrived by trading with the soldiers. Noticing that his son had no interest in books and learning, Martiros pulled him out of the village school, Drastamat was no better in the Gymnasium school as the grades he achieved were barely enough for a promotion. Like all government schools in the provinces of Russia, there was a policy of Russification that limited education in the Armenian language to religion only, on 12 June 1903, the tsarist authorities passed an edict to bring all Armenian Church property under imperial control. 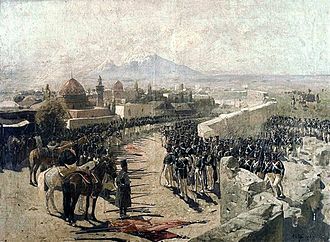 This was faced by strong Armenian opposition because it perceived the Tsarist edict as a threat to the Armenian national existence, as a result, the Armenian leadership decided to actively defend Armenian churches by dispatching militiamen who acted as guards and holding mass demonstrations. 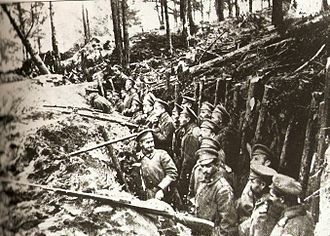 This prompted Drastamat to join the ranks of the Dashnaktsutiun in order to defend churches from confiscation through public demonstrations and he served as detachment commander in the Russian Caucasus Army during World War I. 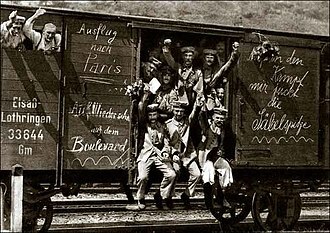 He was one of the commanders of the Armenian volunteer units, in November 1914, he had the second battalion of the Armenian volunteers. 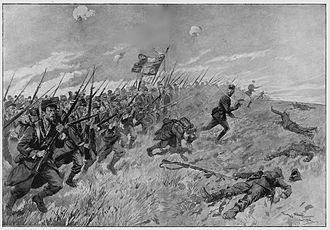 At the Bergmann Offensive, the battalion of the Armenian volunteers engaged in battle for the first time. Mount Aragats is an isolated four-peaked volcano massif in Armenia. Its northern summit, at 4,090 m above sea level, is the highest point of the Lesser Caucasus and it is one of the highest points in the Armenian Highlands. The Aragats massif is surrounded by Kasagh River on the east, Akhurian River on the west, Ararat plain on the south, the circumference of the massif is around 200 km, and covers an area of 6,000 km2 or around 1⁄5 of Armenias total area. 944 km2 of the massif is located above 2,000 m, the name of the mountain is less often spelled Aragatz or Aragac. According to Armenian tradition, Aragats originates from the words Արա Ara + գահ gah, Ara refers to the legendary hero Ara the Beautiful. Aragats was mentioned by the medieval historian Movses Khorenatsi. In his History of the Armenians Khorenatsi claims that the mountain is named after Aramaneak, the son of Hayk, Aramaneak called his possessions the foot of Aragats. The modern Aragatsotn Province, dominated by the mountain, was formed in 1995, a relatively modern name for the mountain is Alagöz, which literally means variegated eye in Turkish. 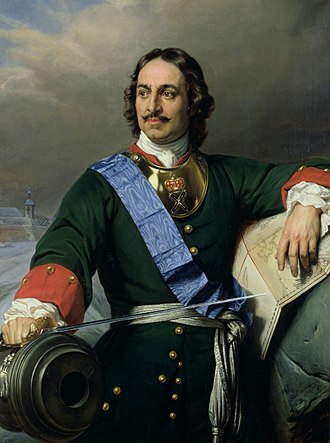 This term was used up until the mid-20th century in European, Tsarist Russian. A variant of the word, was used in Armenian, a village on the foot of Aragats is named Alagyaz. Aragats is isolated from Armenias other mountain ranges, however, it is considered part and the highest point of the larger Lesser Caucasus mountain range. Numerous large lava flows descend from the volcano and are constrained in age between middle Pleistocene and 3,000 BCE, the summit crater is cut by a 13 kilometres long line of cones which generated possibly Holocene-age lahars and lava flows. The volcanic system covers an area of 5,000 km2 and is one of the largest in the region, more recent activity in flank centres occurred in Tirinkatar and Ashtarak, as well as Jrbazhan in the summit area. The magmas feeding Aragats are unusually hot for arc-derived magmas, resulting in long, observations shortly after World War II showed the presence of firn fields and snowfields on the sides of the crater cirque, as well as moraines and glaciers inside the crater. Erzurum is a city in eastern Turkey. It is the largest city in, and the capital of and it is situated 1757 meters above sea level. Erzurum had a population of 361,235 in the 2000 census, known as The Rock in NATO code, served as NATOs southeastern-most air force post during the Cold War. The city uses the double-headed Anatolian Seljuk Eagle as its coat-of-arms, a motif that was a symbol throughout Anatolia. Erzurum has some of the finest winter sports facilities in Turkey, the city was originally known in Armenian as Karno Kaghak, meaning city of Karin, to distinguish it from the district of Karin. After the Arab conquest of Armenia, the city was known to the Arabs as Kālīkalā, during Roman times, Erzurum was named Theodosiopolis. 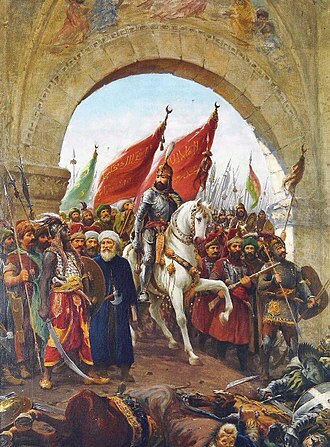 It got its present name after its conquest by the Seljuks following the Battle of Manzikert in 1071, a neighboring commercial city named Artsn was heavily sacked by the Seljuk Turks in 1048-49. Its Armenian and other Christian inhabitants moved to Theodosiopolis, some older sources derive the name Erzurum from the Arabic Arḍ-ar-Rūm land of the Rûm. The surroundings of Erzurum at the Urartian period presumably belonged to Diauehi, Erzurum existed under the Armenian name of Karin. During the reigns of the Artaxiad and Arsacid kings of Armenia, after the partition of Armenia between the Eastern Roman Empire and Sassanid Persia in 387 AD, the city passed into the hands of the Romans. They fortified the city and renamed it Theodosiopolis, after Emperor Theodosius I, emperors Anastasius I and Justinian I both refortified the city and built new defenses during their reigns. Theodosiopolis was conquered by the Umayyad general Abdallah ibn Abd al-Malik in 700/701 and it became the capital of the emirate of Ḳālīḳalā and was used as a base for raids into Byzantine territory. Though only an island of Arab power within Christian Armenian-populated territory, in 931, and again in 949, Byzantine forces led by Theophilos Kourkouas, grandfather of the future emperor John I Tzimiskes, captured Theodosiopolis. Its Arab population was expelled and the city was resettled by Greeks, Emperor Basil II rebuilt the city and its defenses in 1018 with the help of the local Armenian population. The ruins of Ani as seen from the Armenian side. The cathedral with its missing dome is seen on the left, the half-collapsed Church of the Holy Redeemer on the right. In 1905–06, archaeological excavations of the church of Saint Gregory of King Gagik were undertaken, headed by Nikolai Marr. The Church of the Redeemer (Surb Prkich). The natural borders of the Armenian plateau and its peripheral regions according to H. F. B. Lynch (1901). The remains of Armenians massacred at Erzinjan. Ruins of the old walled city of Van seen from the castle rock. The Seljuk era Çifte Minareli Medrese (Twin Minaret Madrasa) is the symbol of the city and appears on its coat of arms. The Turkish-Armenian border by the Treaty of Sèvres. 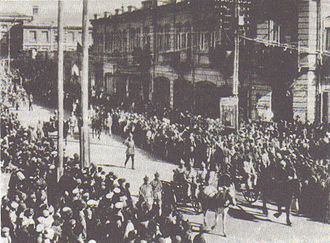 Members of the Soviet 11th Red Army marching down Yerevan's Abovyan Boulevard, effectively ending Armenian self-rule. Petroglyphs from Zavkhan Province, Mongolia, depicting Göktürks (500s–700s). 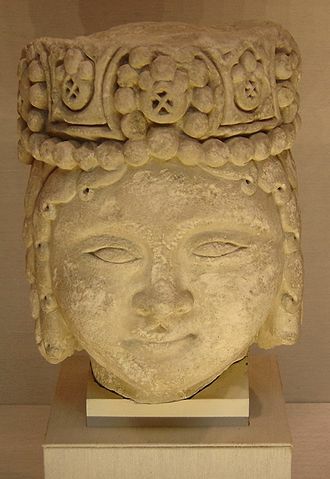 A bust of Dede Korkut—the central character of an epic dating from the 9th Centuries—in Baku.